Oh, my Amazons! I’m back on the road again. I’m in Boston for the next several weeks singing with the opera here, after which I’ll head down to Charleston for another gig until mid-June. You can be sure I packed my knives for this one (thank heavens!). Luckily, my accommodations here are just around the corner from a good grocery and the kitchen is really nice! Sure, it’s not my kitchen filled with gadgets and doohickeys, but it’s certainly enough to make some good food happen. Today, we’re talking simple and delicious. 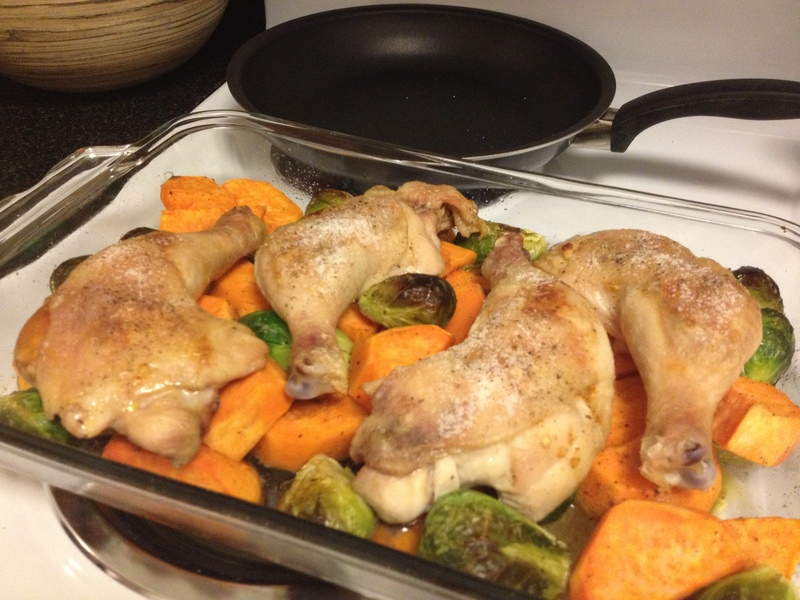 Chicken legs with the skin on, seasoned and roasted in the oven over whole brussels sprouts and sweet potatoes. 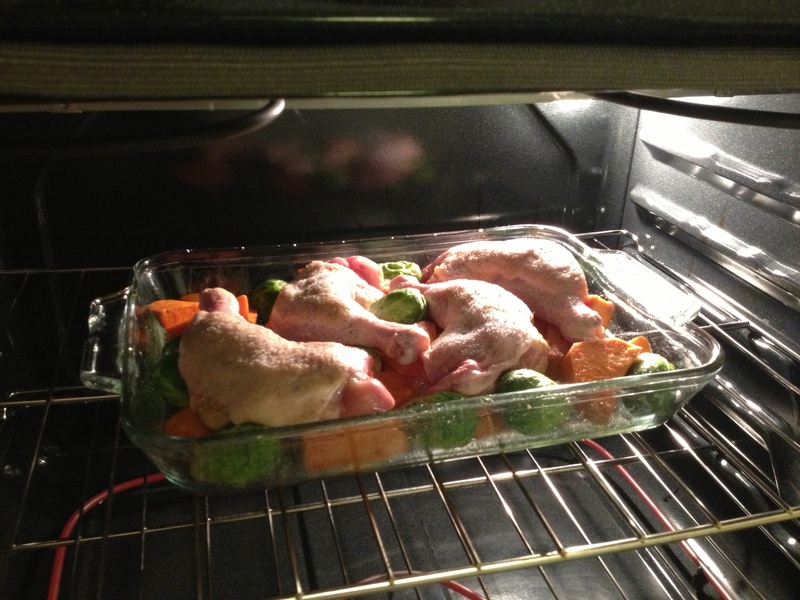 Why roast the legs on top of the veggies instead of separately? Three reasons. One: I like to roast my chicken at high heat for crispy skin and tender meat, but that can lead to some of the fat rendering from the chicken to start smoking. The veggies catch the fat and ease the likelihood of smoke. Two: Flavor, flavor, flavor! Chicken fat is delicious on these veggies! And three: Why on earth would you dirty more dishes than necessary?! Of course you could use chicken breasts for this, but I still recommend getting them with the skin on if you do. Dark meat has more fat, but it also has more flavor, and it gives you a little more protection from overcooking, leading to dry flavorless meat. I usually use an entire chicken for this, so I use a combination of dark and white meat, but without my kitchen shears, it’s a little hard to butcher the bird properly, so I just went with legs. Also, dark meat is ALWAYS cheaper than white, so you can get the best quality available while still being frugal. So, I have to admit, Amazons, I usually would’ve used my cast iron for this back home, but when on the road, you use what you’ve got. I forgot that a Pyrex baking dish is generally going to react very differently from cast iron when it comes to retaining heat and browning, so I’m going to ask you to ignore the pictures a little bit and just trust me on the adjustments. Peel and chop your sweet potatoes into about 1.5 inch chunks. No need to be super precise, but you do want them all about the same size. Pull any loose outer leaves off your brussels sprouts and trim off the end of the stem. 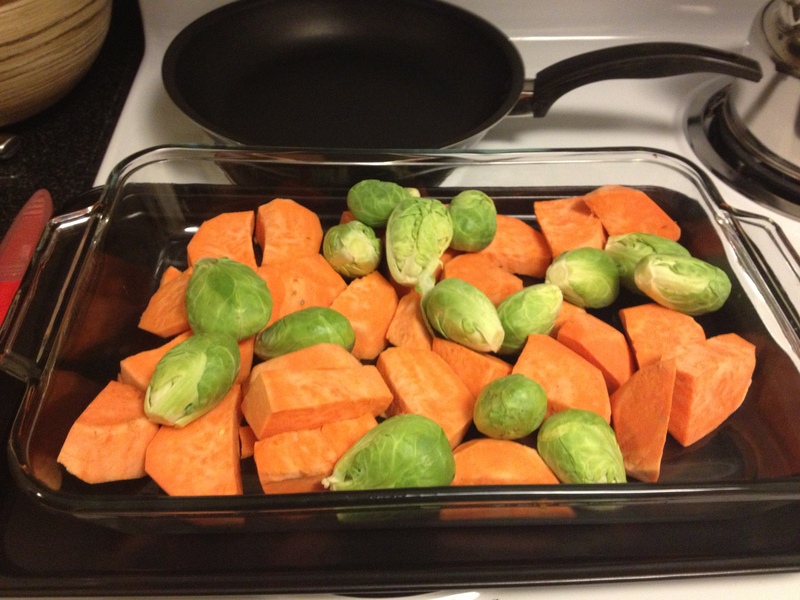 Toss your sprouts and potatoes in a little olive oil and season liberally with salt and pepper. Lay in the bottom of your roasting pan. Next mix the butter, garlic, paprika and pepper. This is going to go under the skin of the chicken legs. 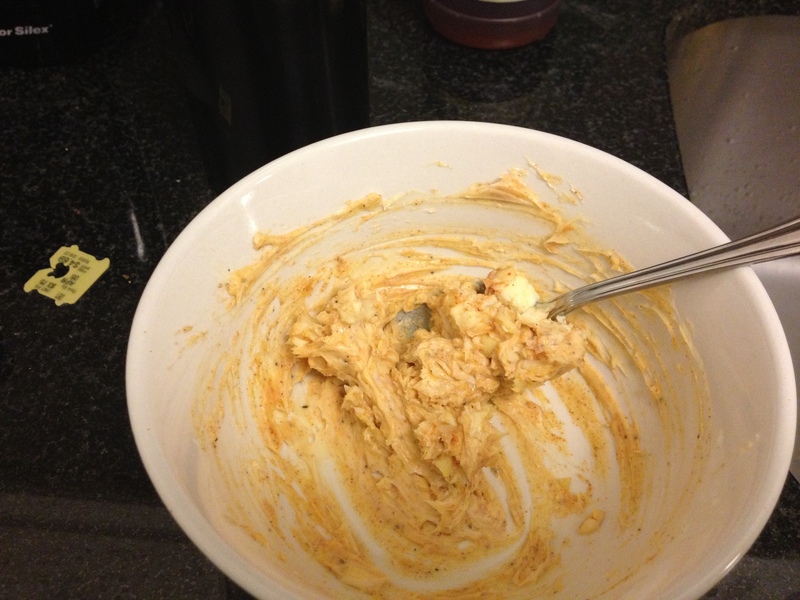 You could add any herbs or spices you like to this butter mixture and I encourage you to experiment! Curry could be very nice. I also love rosemary or sage. Before you put the butter under the skin you’ll want to use your fingers to gently separate the skin from the meat. You don’t want to poke holes in the skin, but you want a pocket for the butter. Once you’ve made space, use a small spoon to introduce the butter and then massage it under the skin and all over the meat. Use a paper towel to dry the skin of the chicken and place on top of your vegetables. Sprinkle the skin liberally with salt and pop in the oven. In about 40-45 minutes, your chicken skin should be crisp and your veggies should be browning and cooked through. When I made mine, the veggies were a little underdone, and I had to put them back for a while. My solution for you: smaller chunks than I used. Smaller pieces cook faster. Sorry today’s installment is posting a little late. I’m still adjusting to my new digs here in Boston. But I’m very excited that one of my castmates also loves cooking! We’ll be trading off dinners from time to time and I’ve already picked up some great ideas from her.